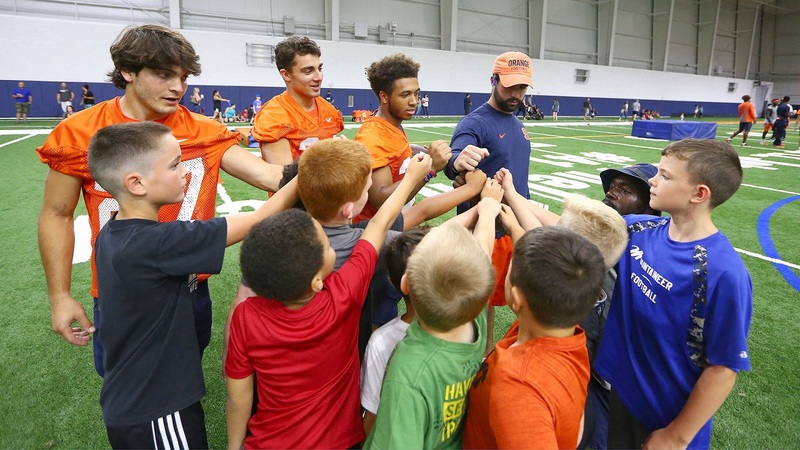 The Syracuse Orange football team welcomed more than 60 children of military families Sunday for Fort Drum Youth Football Day. For the second year in a row, more than 60 children of military families were welcomed onto campus Sunday by the Syracuse Orange football team for Fort Drum Youth Football Day—a session exclusively for youth football players whose family members serve in the U.S. Army’s 10th Mountain Division stationed at Fort Drum. 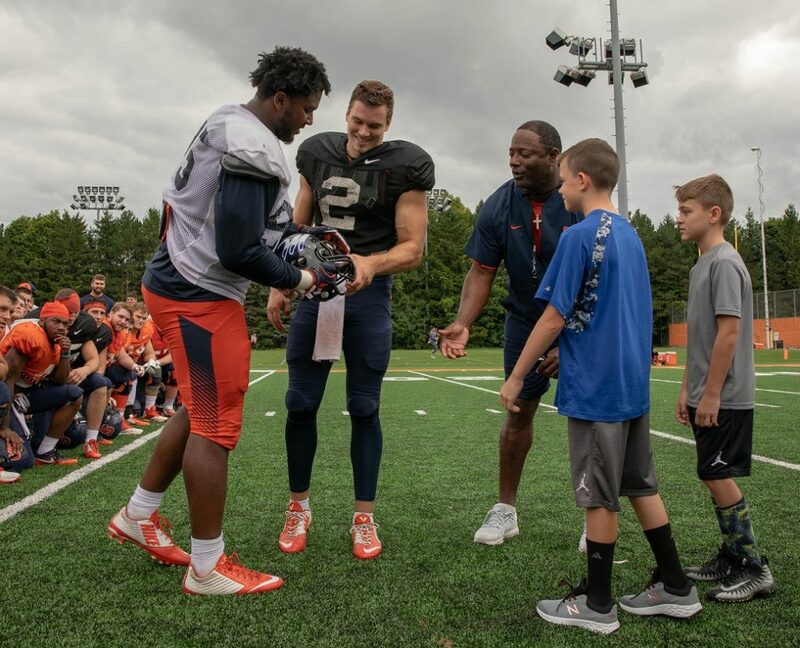 The day camp, part of the University’s longstanding commitment to veterans and the military-connected, gave the young players a chance to watch a pre-season practice, test their skills with drills run by the SU players and get autographs. The children presented a signed Fort Drum Mountaineers helmet to the Orange, which was accepted on behalf of the team by senior quarterback Eric Dungey and redshirt senior defensive tackle Chris Slayton. Fort Drum Youth Football Day gave the young players a chance to watch a pre-season practice, test their skills with drills run by the SU players and get autographs. The children and their families arrived Sunday to watch the tail end of team practice before the youth clinic began. 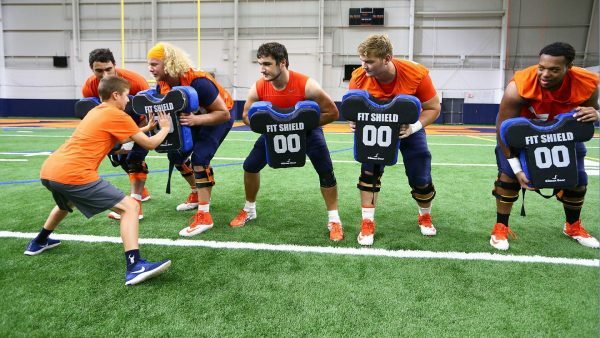 Campers rotated through six stations, including a blocking station with the offensive lineman, a ball-security station with the running backs, and a tackling station with the linebackers. Following the skill instruction, the children and their families heard from Orange senior wide receiver Ben Brickman, who served four years in the Marines before enrolling at Syracuse. Sunday’s event aligns with and supports Chancellor Kent Syverud’s commitment to make Syracuse University the “best place for veterans.” The objective is supported by a series of strategic initiatives, including the creation of the Office of Veteran and Military Affairs and IVMF. The University is furthering that commitment with construction of the National Veterans Resource Complex, a first-of-its-kind multi-use facility dedicated to advancing academic research, programming and community-connected innovation serving the social, economic and wellness concerns of the nation’s veterans and families. Sunday’s event is one piece of the overall Syracuse Athletics Military Appreciation Program, which includes the “Cuse for the Troops” ticket program where tickets can be purchased to send military members or veterans to the Military Appreciation game on Sept. 22 for free, and the “Military Pass,” which grants active-duty military personnel and veterans two complimentary tickets to a home football game during the 2018 season. Complimentary tickets are available for Syracuse’s Oct. 20 game against North Carolina during Orange Central Weekend and the Nov. 9 game against Louisville.